Drift TV, by Saffron — a company specializing in sleep-oriented smart lights — is a $99 device that aims to improve your ability to fall asleep at night. The light tricks the brain into believing its daylight, thus upsetting our circadian rhythm — our natural sleep/wake cycle — by retarding the production of melatonin, the hormone released to signal your brain that it’s time to sleep. Now, you can partake in your usual late-night Netflix binge and still get to bed at a decent hour, or, decent-ish. 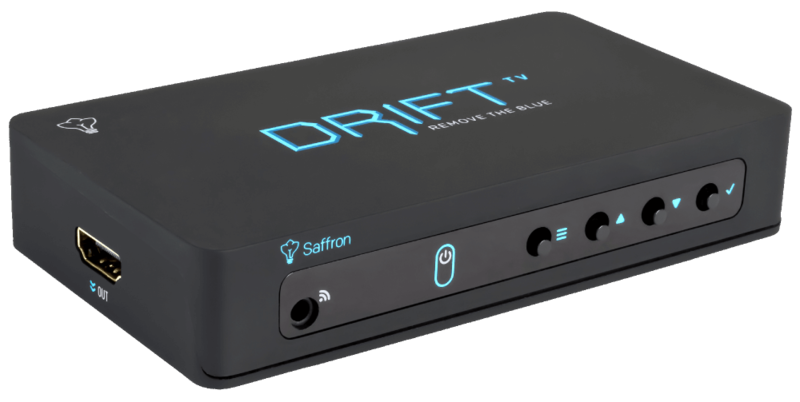 Drift TV connects to your television using via HDMI switch or AV receiver and allows you to set a desired sleep time in the on-screen menu. From there, Drift does all the heavy lifting by slowly removing the blue spectrum light from the screen, starting an hour before that time. Users can also set a desired wake up time at which point your TV will return to its full-colored glory. Drift TV is coming in December 2015 and is said to sell at a $99 pricepoint. You can get yours by signing up for an email update about the release at the Drift website.